Book The Silvercloud Tailgate Trailer For Your Next Party! Home » Press, Awards & Events » Silvercloud Beer Trailer » Book The Silvercloud Tailgate Trailer For Your Next Party! If it’s one thing Texans know how to do, it’s how to toss back an ice cold beer on a hot Texas day. Beer lovers everywhere will love our Silvercloud tailgate trailer, especially for a UT tailgate party. 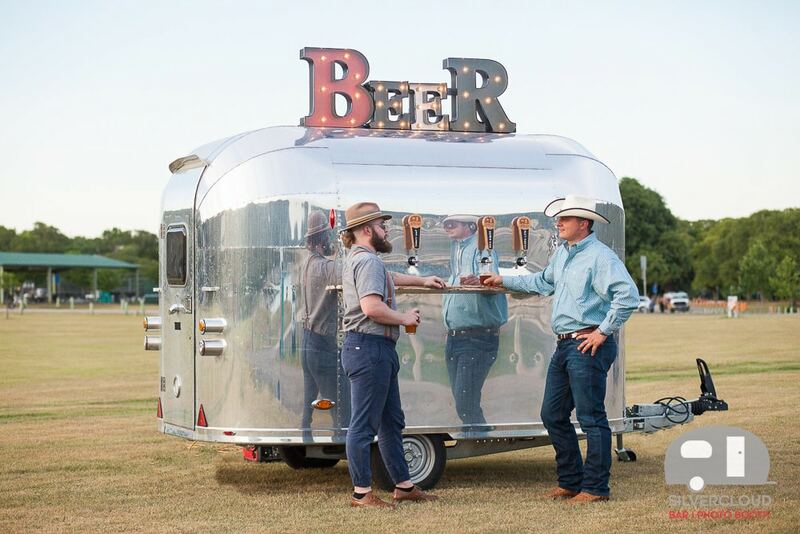 We have 4 taps on the exterior of our shiny silver vintage trailer and can serve up to 4 different types of beer – even your own home brew (as long as you keg it.) Our custom designed beer delivery system will keep your beer ice cold at your tailgate party no matter how hot the day or how long the game. But wait… there’s more! The other side of the Silvercloud draft beer trailer has a full serving bar on the other side, so you can serve chips, bottled water or other types of drinks at your event. And at only 12 feet long, our beer trailer will fit at any tailgate party. Our packages are flexible; if you want to ‘DIY’ it, we can bring the trailer and you can bring the beer! Or let us handle everything and we’ll purchase the beer and serve it at your event. Our tailgate trailer also perfect for picnics, barbeques, corporate events, music festivals, birthday parties, weddings and beer festivals. Your friends will be talking about your party for years when you include the beer tap trailer at your next event. Contact us to learn more or to book for your event.